This custom corner entertainment center came about when a friend needed a place for her T.V. and stereo components. So many people liked it, I ended up building a few unique versions of it; making it smaller, using more expensive woods and different species of wood. Some used it for different purposes also. The e-book version of this unit takes a minimum amount of materials and materials that are on the more affordable side. It could be built in different areas also like a living room, bedroom, dining room or even a smaller version of this unit in a kitchen. The tools to build this unit are also very minimal. If you don't have them I would venture to say you know someone who does. I have never charged anyone to build this unit but I would suspect you could charge upwards to a $100 if you wanted to build it for other people. If you like doing projects like this then you will definitely enjoy building this unit and enjoy the beauty of it in your home. If you are learning and doing finish carpentry you are in for some great rewards. Whether its in the form of building unique things like that shown in my Finish Carpentry Help Free Entertainment Center Ebook or all the way up to trimming houses, the gratitude is wonderful. You not only get the gratitude but you are learning and doing a craft which some people just can't do. If you like doing finish carpentry and are enjoying these rewards I invite you to take it a step further and get more aggressive. In addition to my Finish Carpentry Help Free Entertainment Center Ebook, I've also written an e-book on Building Hand Railings. It is written more professionally, yet in the similar simple format and will take you to the next level. Even if you are not familiar with finish carpentry it is still simple enough to get you through the process and I am always available by e-mail for questions. 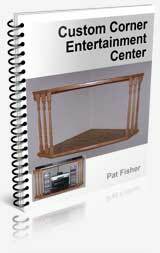 Click here to from Finish Carpentry Help Free Entertainment Center Ebook to Home.